Verified on 22 Apr 2019. Air Asia has Low Fares on Flight Booking. No coupons required. Enjoy the limited persons' service now. You’re only allowed one piece of cabin bag on board that must not exceed 56cm x 36cm x 23cm including handles, wheels and side pockets. This bag must be able to fit in the overhead compartment. With Air Asia discounts, one can avail the low-cost fares for flying any destination of your choice. With their unique no-frills business concept which is an innovation that has changed the airline business forever, AirAsia boasts of the most extensive network and most frequencies to destinations around the region. Get valid AirAsia India promo code and offers at Grabon and save on your online flight bookings at airasia.com. AirAsia Berhad is a Malaysian low-cost airline headquartered near Kuala Lumpur, Malaysia. It was the largest airline in Malaysia in fleet size and destinations covered. It is also the largest low-cost airline in Southeast Asia. With exclusive AirAsia promo codes, the flight tickets can be booked at the lowest cost available ever. You can book an AirAsia flight ticket with Goibibo to get the best deal or directly from their website. AirAsia flies to more than 100 Destinations. Go on an epic Asean journey with AirAsia Asean Pass, a travel pass that allows you to book our base fares for at least 14 days or more before your departure date. Travel to 140 routes all across Malaysia, Indonesia, Thailand, Brunei, Singapore, the Philippines, Laos, Myanmar, Cambodia,and Vietnam using fixed credits! Start your great Asean adventure with AirAsia Asean Pass now! AirAsia offers the lowest fares online to over 100 destinations across Asia with numerous frequencies a day. It offers the chance to fly with Skytrax’s ‘World’s Best Low-Cost Airline’ for 7 years running, as awarded to AirAsia. 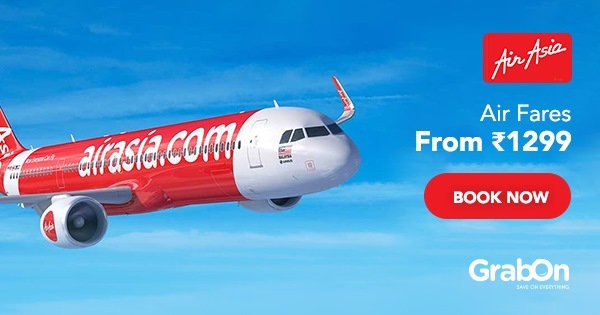 How To Use Air Asia Coupons On GrabOn? Air Asia Berhad or Air Asia as it is commonly known as among flyers is a low cost airline flying to over 100 destinations across the globe. In terms of fleet size, it is perhaps the biggest airline. It introduces from time to time different programs/plans for flyers but the notable ones include Premium Flex and Air Asia Asean Pass. Both these programs offer several benefits. Air Asia, ever since its inception, has offered interesting and attractive offers to its customers. These deals are offered in form of coupon codes or promo codes and can be accessed on GrabOn. Since every coupon code has an expiry date, it is important that you keep track of the updates on the offers regularly. Coupon codes on expiry are invalid. And if you find that it was the deal you were longing for, you’ll have no option but to regret. So, make sure you check out this space frequently so that you don’t miss out on your favorite deal.